Robertus Valturius, (De re militari, in Italian) Opera de facti e praecepti militari. Verona: Bonino de Boninis, 17 February 1483. 310 x 208 mm. With 96 woodcut illustrations attributed to Matteo de’ Pasti. First Italian edition of the famous military treatise "De re militari", translated by Paolo Ramusio. The first Latin edition (1472) was the earliest printed book with technical illustrations, and the present edition is the first technical treatise in the vernacular. 310 x 208 mm. – 313 leaves. Initials supplied in red and blue, 96 woodcut illustrations. Roberto Valturio (1413-1484) composed De re militari on behalf of Sigismondo Pandolfo Malatesta, ruler of Rimini (1417-1468), c. 1455-1460, in the midst of the military transition from siege-technology to gunpowder. His twelve books on warfare and military technique, however, concentrate on ancient and medieval weapons and strategies, which were still common in the 15th century. The first edition, published in Latin, was printed by Johannes de Verona in 1472. That edition was the earliest printed book containing technical illustrations, it is regarded as the first book printed in Verona, the second Italian printed book with illustrations and the first containing woodcuts by Italian artists. In 1483, Bonino de Boninis reprinted the celebrated work and published the present Italian translation shortly after. This edition is accompanied by 96 magnificent woodcut illustrations depicting military equipment such as siege towers, battering rams, scaling ladders, war chariots, cross-bows, cannons, armed galleys, pontoons, a lifebelt and a paddle-wheeled submarine. 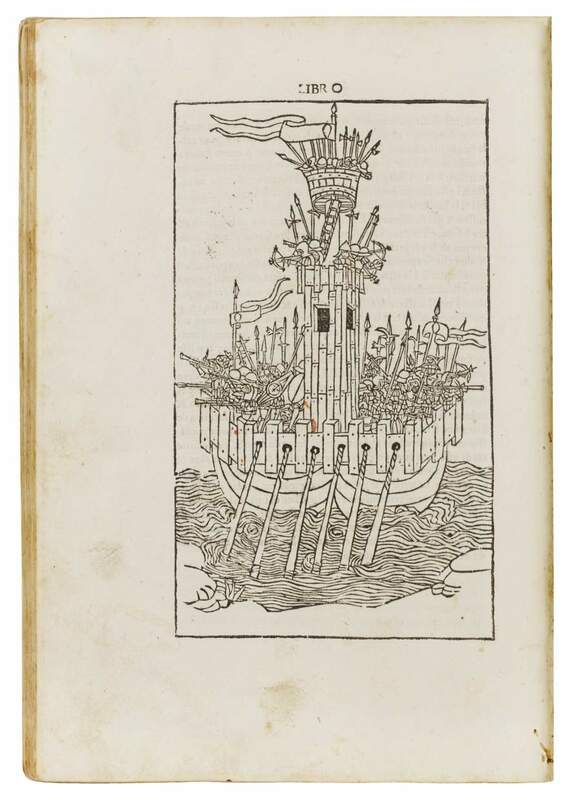 They are slightly reduced copies of the woodcuts of the first edition, the designs of which are usually attributed to Matteo de' Pasti (c. 1420-67/68), a medallist and architect, who also worked at the court of Sigismondo Malatesta.